Why do people fast? Is abstinence viewed as a mood altering departure from the norm? Upwas (उपवास) in Sanskrit literally means to be in the proximity of the almighty. So in our abstention from corpulent and carnal pleasures do we inch closer to communion with our higher powers? Socially, fasting may have had considerations of equitable distribution of foods in shortage and the conservation of natural resources. But ironically, don’t we vie for that blessing and want more and more of it for ourselves? Like how fasting invariably turned into its antithesis, feasting, for us as kids? Is fasting a form of “holier-than-thou” feasting on the feeling of benediction? Growing up in India, we enjoyed the vrats and festivals like Shivratri and Ekadashi only because we got to eat special and delicious foods, like sabudana khichdi, bhagar and danyachi amti. On days grown-ups at home fasted, we would eat twice as much, totally living the Marathi idiom - एकादशी आणि दुप्पट खाशी ! Once we had downed our chow, we would lie in wait for the yummy “fast foods” that would be made ostensibly “for adults only ”. I have memories of being woken up in what seemed like the middle of the night by the sounds of the उलथने spatula clinking in the kadhai and the wafting delicious savoury aroma of sabudana khichadi. Toddling up to the “never-too-tired-to-love and pamper” grown-ups, I would be spoon-fed some of the delicious stuff before being sent back to bed. In our “ Yuck! I never want to get married” phase we rebelliously scoffed the idea of fasting on हरितालिका or वटसावित्री pooja to ensure (ensnare?) a good husband. Yet, horses wouldn’t drag us from the sweet potato and potato kees (like a rossti) and a myriad array of sweets that were the prerogative of fasting females on the day. As newly weds, we stomached the mandatory fasts, not so much out of fear of being misunderstood as less loving or devoted towards our husbands, but out of the anticipation of the feast at the end of the forced famine. That we apparently got some longevity benefits for our spouses, was but a bonus! As busy mums trying to balance work and home and conflicting requests or demands, making some of these “fast foods” was a sure shot way of pleasing everybody, always and quickly. And now as “couldn’t- be-bothered” wives, Facebook enthusiasts and food bloggers, we can’t wait to go back to our laptops once we finish making this meal of peanut curry a.k.a danyachi amti and rice in 10 minutes flat! The meal can be on the table in less than 15-20 minutes. 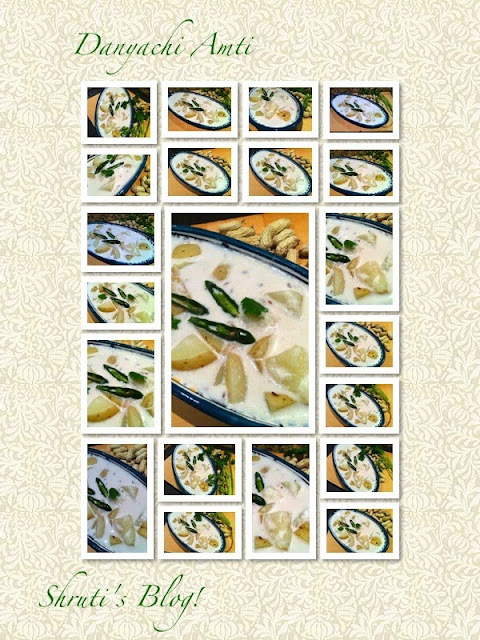 Danyachi Amti is a soupy gravy, usually served with bhagar, a rice or upma like dish made with samo seeds or jungle rice. However, we love danyachi amti with rice, too. It’s seemingly rich, but consider the fact that peanuts are a good source of proteins and other nutrients as well as dietary fibre. And don’t ignore the fact that this soup warms your gut into such a comfortable and satiated feeling. For that matter, you can make this for your next dinner party, in place of the bored-to-death dal. 2 medium potatoes – peeled and cubed. I rarely peel potatoes – just get the washed ones. 1 or 2 cloves (laung) - haven't seen anyone else use clove, so can claim it as a family secret ingredient! Blend the roasted and skinned peanuts, yoghurt/buttermilk, coconut and cloves with one and a half cups of water into a fine paste. Adding one chilli to the belded mixture gives it a zing, so if you want to increase the heat factor, add another chili while making this paste. Heat the oil in a saucepan or pot and add the cumin seeds, chopped chillies, cubed potatoes and sauté for a minute or two. Add some water and cover and cook till almost done. Add the peanut paste and adjust the consistency by adding water if required. The consistency should be that of a thick brothy soup. Boil for 7-8 minutes and add salt, sugar/sweetener and lemon juice to taste. Garnish with coriander and serve hot with samo rice or even with steamed plain rice. You can thin it slightly and serve it as a soup - like a badam shorba! Labels: badam shorba, Danyachi Amti, Peanut Curry, एकादशी आणि दुप्पट खाशी !